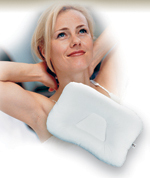 The Travel Core™ Pillow allows you to sleep comfortably while traveling. Get the support you need while sitting (lobes down) or lying down (lobes up or down) This travel pillow's convenient size makes it easy to carry and store. Neck pillow measures 18 in x 9 in and is fiber-filled. Blue Pillow case sold separately.